Repeat clients are the best. 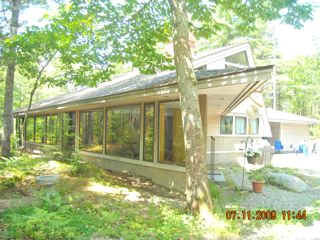 Guest House Photos CLICK HERE TO SEE Guest House Photos. 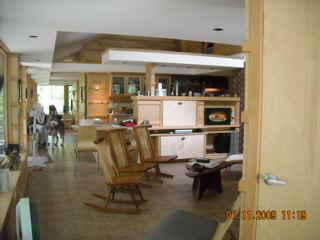 The Client moved into house December 13, 2003. 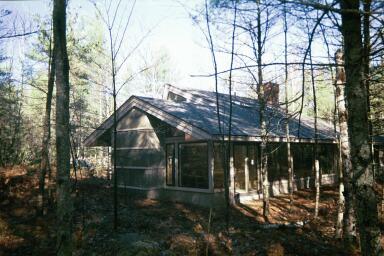 The house is located on a wooded site in Mid- coast Maine. 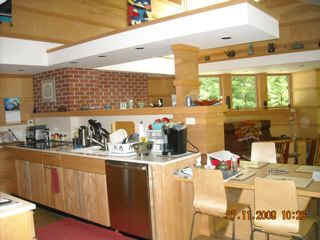 This is a "Not so big house" with 1275 SF on the ground floor plus 475 SF on the Balcony over looking the living area. 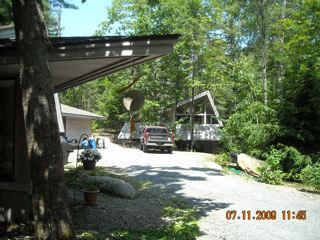 There is an open carport for two cars and tool area to the North. The house is what I call a single great space. 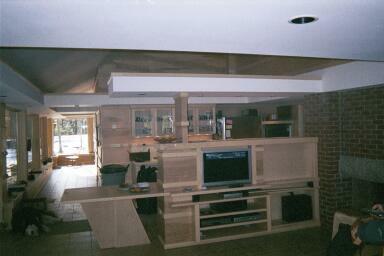 The major living areas are all open to each other so that even though the house is small it will live larger. Colleen and I tend to agree with him. romantic. It's exactly as I envisioned it when I first saw the plans. I think when all the "fit and finish" work is done you will have created a masterpiece. our dream a reality. We simply love the house. Space, scale and natural light. Space in this house is the mystery of what is beyond the view and the continuation of the low ceiling inside to the soffit outside. The floor is at the same level as the outside natural ground so it is like living on the earth with the beauty of nature. Scale in made here by the horizontal battens at 16 inches on center and the contrast of the 6'-9" low ceiling with the very high cathedral ceilings. 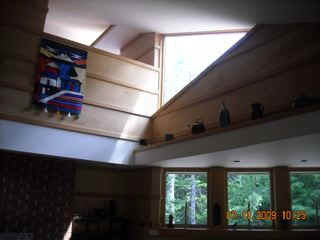 The natural light comes in and changes the light in the house continually. 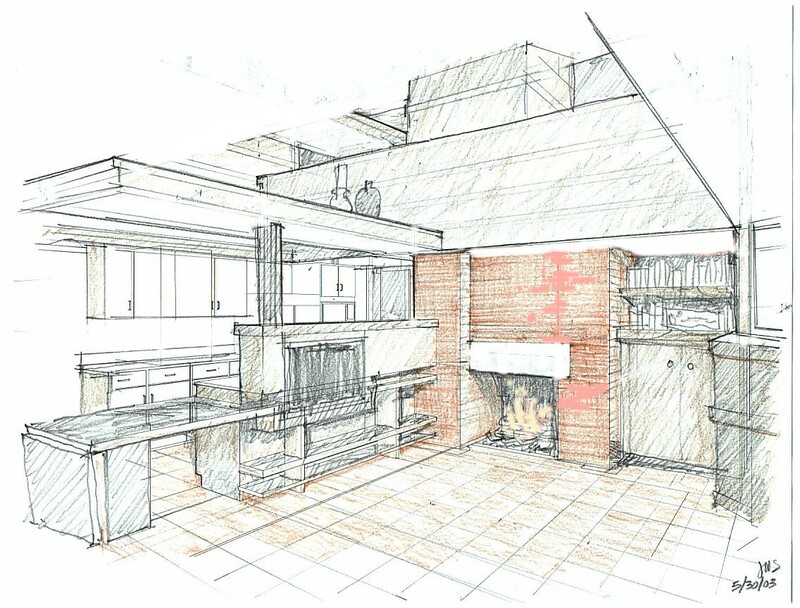 Sketch of the Fireplace, Living, Dining and Kitchen are one space. The ceiling opens to the Balcony Study above. 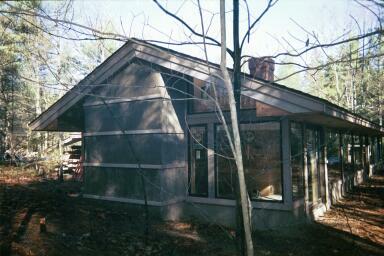 The opposite side of this space is all glass open to the woods view to the south. Sunlight will be present all day long from this side. 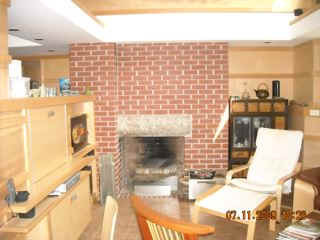 The passage on the left of the photo leads to the private part of the house. 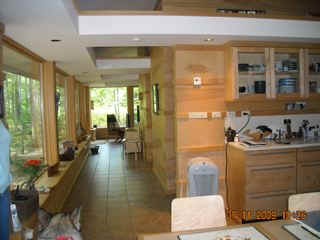 The flat screen TV is built into the high back of the kitchen counter which also blocks the view of the Kitchen counter from the living area. The end of the table has a drop leaf and gate leg. Balcony is to be used as an office/ study. Both clients have and use computers and this is where they will be. The door in the distance opens to a small guest room. 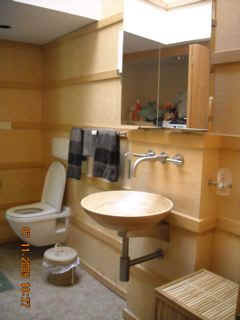 Notice the shelf over the door and the open ceiling above the shelf. This opening will be closed with glass to stop sound but open to allow light and a visual feeling of each area to be extended and shared by the other. The chimney is ghosted in this sketch but is an important element in the space of this house. Good architecture can never be represented in photograph or sketches it must be experienced to be understood. 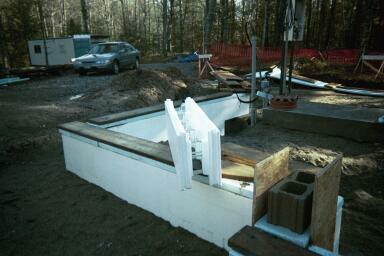 Construction photos showing the ICF units. These units are 48" long by 16" high by 11 1/4" thick. Made from Styrofoam the sides are 2 1/2" thick with a center core space 6 1/2" wide which is filed with concrete. 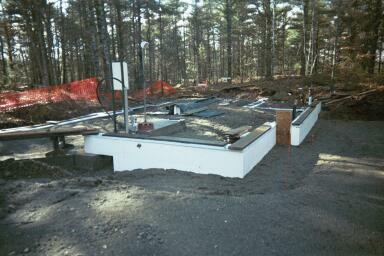 The end result is an insulated reinforced concrete wall with an 28 R insulation value. The inside and outside finishes are attached to the units at 12 inches on center points using screws which fasten to plastic cross ties. 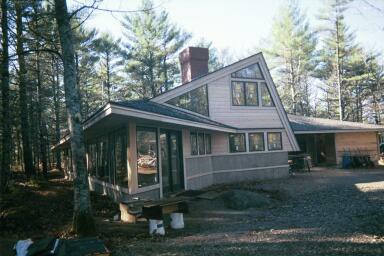 Builder for this project is Christopher Doherty if you would like more info on his fine work send me an e-mail. 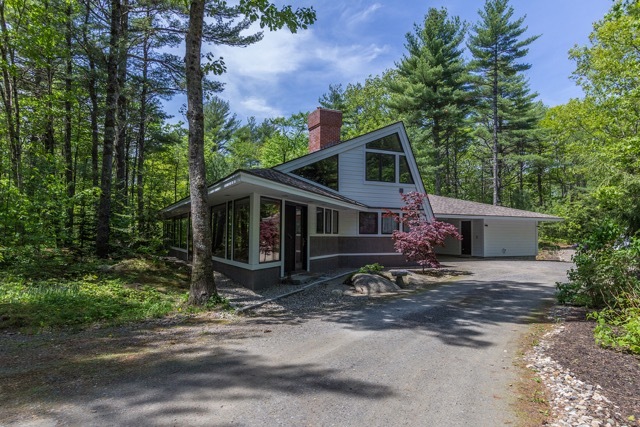 http://www.dohertybuilt.com/ Chick here for Doherty Built Inc.